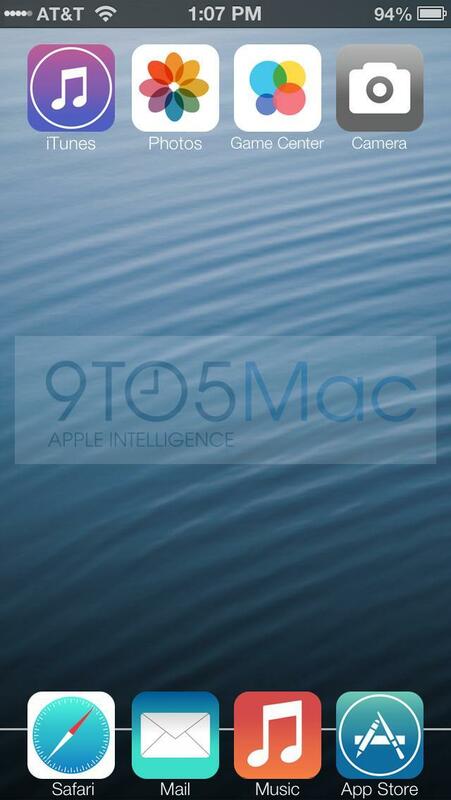 We’ve already imagined what iOS 7 might look like should Apple implement several new ideas we’ve thought up, and now 9to5Mac has published its own set of mockups. The difference is that 9to5Mac said that it has already seen real screen shots from iOS 7 but, because Apple can track where those came from, it decided to create new mockups in Photoshop that resemble what has already been seen. As you’ll note, the design does indeed seem to be “flatter” as we’ve heard. There isn’t any gloss or shading on the icons, and instead each looks much simpler than before. 9to5Mac said that Apple extended the simplicity into the cell signal bar, where instead of bars users will simply see dots indicating the strength of the current signal. Presumably there will still be a way to identify an LTE connection, too. Finally, black and white apparently do have large roles in the operating system. There are two themes available, and it’s unclear if the iPhone will take advantage of the white theme during some conditions and the black theme during others (driving at night maybe). The black theme has a black keyboard while the white theme employs a grey keyboard. Apple will unveil iOS 7 later today so be sure to head over to our WWDC 2013 live blog at 1:00 p.m. Eastern and 10:00 a.m. Pacific.